Living… in abject squalor aboard the Snowpiercer, the train carrying the last few thousand humans on Earth. 18 years ago, 79 nations released the cooling agent known as CW7 into the air as a measure to counteract global warming. The CW7 inadvertently rendered Earth a Hoth-like freezing, uninhabitable wasteland, and the survivors who were able to board the train were quickly stratified into classes and separated by the train’s leader, Wilford. Curtis lives with the underclass in the tail of the train, huddling in tight quarters, watched by Wilford’s soldiers, subsiding on gelatinous black protein blocks. Profession… de facto leader of the back of the train. With spunky young Edgar at his side, he devises a plan to get past the guards and take control of the train. He is not going to rush into it, though – he’ll only have one chance. Interests… none. 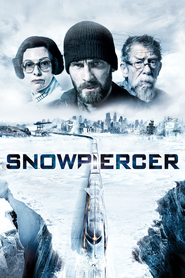 The Snowpiercer is truly hell on wheels, at least where Curtis lives – he is too low on Maslow’s hierarchy of needs for interests. There is only survival. Relationship Status… single. Despite having a great deal of time on his hands, Curtis has nothing resembling a significant other. Challenge… staging a revolution. He and his motley crew of fighters aim to get to the front of the train and the “sacred engine,” which is built to run forever. The odds are stacked against them. They have no weapons, but they also have nothing to lose. The log-jam, one-car-at-a-time nature of the train actually plays to his advantage as it limits the number of Wilford’s guards who can fight them at a time. Personality… laconic, tenacious, and intense. A fiery rage lies dormant within him. Morale has obviously been low in the tail of the train, but the always-intense Curtis’ spirit has never broken, which makes him the right man to lead the revolt. Curtis Everett's popularity ranking on CharacTour is #3253 out of 5,000+ characters. See our top-ranked characters and read their profiles.